FOR a country that sees an average of 21 storms a year, the Philippines needs more than its present radar facilities and three weather experts, a congressman said. Rep. Angelo Palmontes (Party-list, Agham) also said the state weather bureau operates only seven Doppler radars, when the ideal number is 18. “We lack the necessary equipment and a good space program,” Palmones said, adding that the lack of preparation against extreme weather has cost the country billions in losses due to floods and landslides. In his first term as a party-list congressman, Palmones filed House Bill 1877, for the modernization of the Philippine Atmospheric, Geophysical and Astronomical Services Administration (Pagasa). A separate bill, HB 2004, seeks Pagasa’s exemption from the Salary Standardization Law, so the agency can offer higher salaries and hold on to highly trained personnel who are often lured away by more lucrative job offers abroad. Palmones said he has also filed a bill for the development of the Philippine Space Agency Program, which will unite the efforts, information and technical expertise of government agencies who deal with the weather. The bill is now in the Senate, awaiting approval. The country is practically a big storm laboratory, he quipped. A new course, Bachelor of Science in Meteorology, was recently introduced in four state universities in the Visayas, as well as Albay in the Bicol Region, in Central Luzon and in Ilocos Norte. 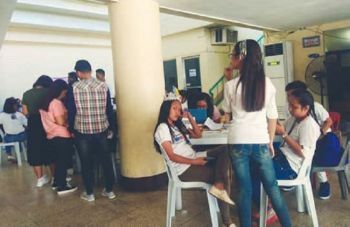 They started with 32 scholar-meteorologists, who will be graduating in 2014, as their first batch; the enrolment went down to 28 and now, they have only 16 new enrollees, the congressman reported. “We are the only country in the Southeast Asia that has no unified space program,” said Palmones. He said the space program bill, if approved, will unify the efforts of the National Telecommunications Commission, National Disaster Risk Reduction and Management Council, and Pagasa. It will also empower the government to launch a satellite that will be managed by the NTC. Our present satellite, Aguila, launched by China and utilized by telecommunication firms, will be de-commissioned this year, said Palmones. A space program and a satellite, he said, will make it easier to monitor weather conditions and other hazards on the ground, as well as bring down the cost of broadband connectivity. “Ang tibuok nasud Wifi-ready (This would make the entire country Wifi-ready),” he said. Palmones recalled that when Agham was first elected to the House of Representatives in 2010, the science and technology budget was only P3 billion. In the 2013 national budget, this has increased to P10.5 billion. But the United Nations Educational, Scientific and Cultural Education Organization has prescribed that a country’s science and technology should be at least one percent of the annual budget. That means this year’s share should be at least P20.06 billion. Asked about his accomplishments in his first term, Palmones said three of his proposals became part of the President’s 12-point Legislative Executive Development Advisory Council measures. These are the law penalizing the tampering of the government’s risk-reduction and preparedness equipment; the Pagasa modernization bill, which is still pending; and proposed laws that establish productive and protective forests, which have yet to be approved. Of the 209 legislative measures he drafted, nine have passed upon third and final reading, and two are now waiting for the president’s signature. These two are the incorporation of a provision he authored to consolidate the K+12 Bill and the Pagasa modernization bill. Like all party-list contenders, Agham will need to earn at least two percent of votes cast in the party-list elections, in order to return to the House. Each party-list organization can win a maximum of three seats.